I got a big package in the mail yesterday! 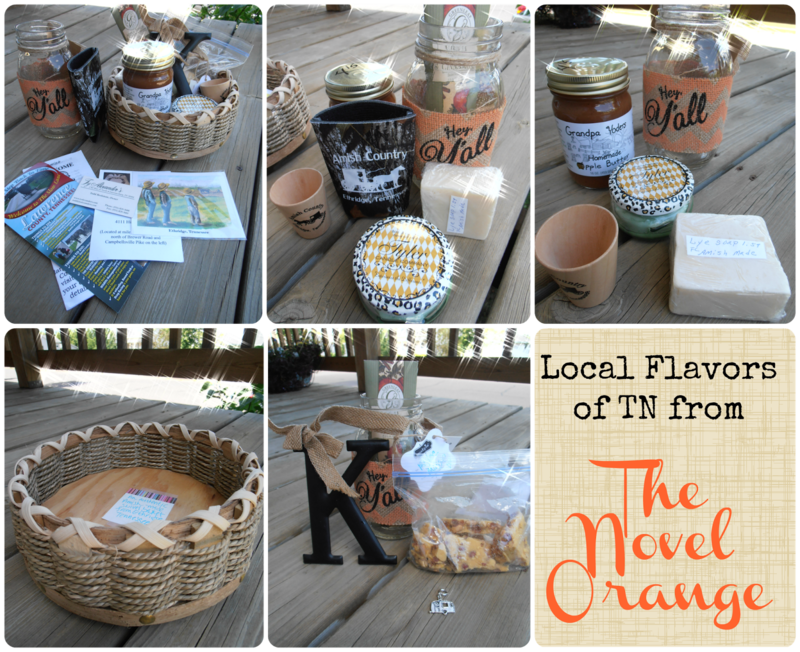 I saw the Tennessee Vols packaging tape and knew immediate it had to be my Local Flavors Swap package! I was partnered with Maggie of The Novel Orange and we had so much fun getting to know each other and discovering all the things we had in common. I've done the "Find Your Spot" quiz twice now, and both times got a lot of results for towns in Tennessee. I couldn't wait to see what Magie had chosen. Some information about Amish country and some of the businesses my goodies came from. A cute little Amish postcard. A cute little southern mason jar with a welcoming "Hey Y'all" on chevron printed burlap. An Amish stamped, camo printed can coozie. A sachet of apple spice and cinnamon potpourri. A wooden shot glass from Amish Country. A metal "K" with a burlap bow. Some Amish made lye soap, which smells super fresh and clean. A cute little camper wagon charm. A jar of apple butter. Maggie picked things I just loved. Good smells, and natural style. The peanut brittle is super yummy! And I can't wait to try the apple butter on homemade bread. I think I'll put the basket in my office and use it to hold sewing or stamping supplies. The "K" is going to go up in my office. It was so fun seeing everything she picked and getting a little taste of Tennessee. Want to see everyone elses' reveal? Just click below to be taken to the link up. Great "Flavors" from TN! Amish Country is great! The apple butter is divine! I love apple butter! My mom usually makes some but they lost their apple trees last year due to a fungus that came through. The new trees aren't big enough to produce apples yet. So my mouth instantly started watering when I saw it! I agree! I think Tennessee would be awesome place to visit! Yes ma'am! It was a pretty great box of awesomeness! Oh, Wow! You received a great package! How fun!!! Maggie is a pretty great swapper! :) And she was lots of fun to get to know.